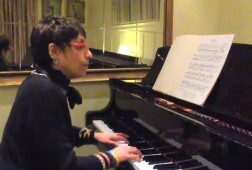 Shirley Gruenhut plays the Sarabande from Debussy’s Pour le piano. Playing the Sarabande, the second movement from Debussy’s Pour le piano, is like losing yourself in a gorgeous Impressionist painting—it’s just swabs of color and sounds. 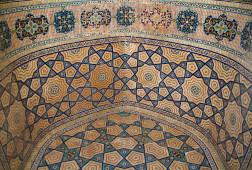 And yet it retains those stately measures of three, the rhythm and feel of a dance movement. I discovered this piece many, many years ago—I believe I was in high school. I heard it on the radio at WQXR, and I went berserk. I said, “I must play this piece!” I bought the music with my allowance. And I had to wait; it came from France. I was so excited, and my teacher was amazed that I wanted to tackle something this difficult. 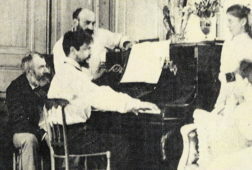 Debussy wrote Pour le piano rather early on in his career, but it was a major jumping off point, for his piano pieces became increasingly more difficult after that. Take his use of dynamics in the Sarabande, his subito pianissimos after humongous fortissimos with arpeggios—you have to jump three octaves to accomplish that on the piano. You also need all three pedals for this piece: the sustaining pedal, the soft pedal, and the damper pedal. It’s very difficult to pull off. 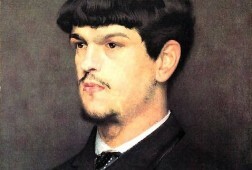 Debussy composed much of his music first and then named it afterwards. The Sarabande is named after a dance of Spanish origin, but Debussy is mixing his sonorities, because he doesn’t stay in one key. It goes all over the place because he uses the pentatonic scale throughout, plus he uses all these major and half-diminished seventh chords and parallel chords, one after the other, so you lose tonality in the sonorities and the harmonies that he uses. It paints an incredible picture. 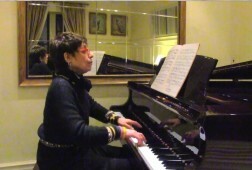 Guest Writer Shirley Gruenhut graduated from Brooklyn College, as the first-time recipient of the prestigious Charles Ives Award for Excellence in Musical Performance, and studied piano accompanying on the graduate level at the Manhattan School of Music. 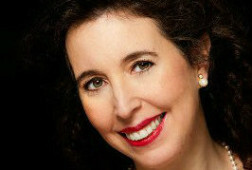 She assisted at the Metropolitan Opera House studios and has performed in Europe, Israel, and here in New York. She was founder and co-founder of several chamber music ensembles, including The Soiree Sisters, The Urban Stress Trio, and co-founder and Musical Director of Handel With Care. She is an avid chamber music player and continues to perform regularly in New York. 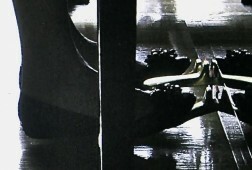 (Piano Solo). Composed by Claude Debussy (1862-1918). Edited by Ernst-Gunter Heinemann. For Piano. Piano (Harpsichord), 2-hands. Henle Music Folios. Urtext edition-paper bound. Impressionistic. SMP Level 10 (Advanced). Collection. Introductory text and performance notes. 32 pages. G. Henle #HN385. Published by G. Henle (HL.51480385). Just lovely! This is timely for me as I just started “relearning” this piece, having played it in college many years ago. Thank you for sharing. 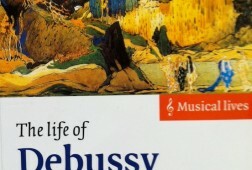 Don’t miss another Debussy article. Sign up for our free Tip of the Week newsletter.